At Veran, we stand behind our technology—and you. Hands-on training, demos and virtual support will help you master our software and deliver a better patient experience. Get ready to see bronchoscopy in a whole new way. A secure, HIPPA-compliant virtual portal connects you to an experienced US-based clinical specialist who is ready to answer your SPiN System™ questions before, during and after procedures. To sign up for vSupport, call 1-866-508-9653. 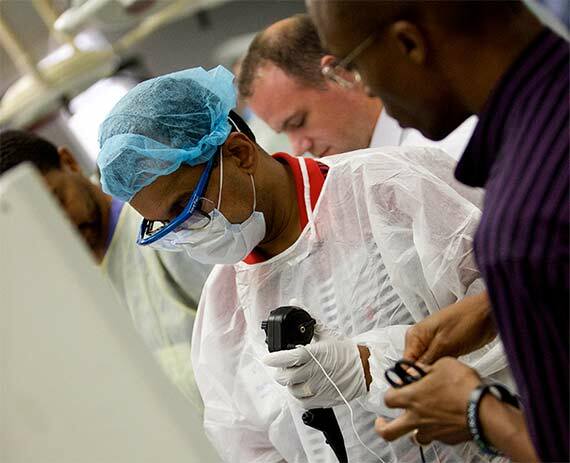 A hands-on intensive SPiN System™ training education program (at our state-of-the-art training facilities throughout the United States) include peer-to-peer sessions that feature cadaver simulation, hands-on training, and didactic lessons from leading physician experts. As part of our ongoing partnership, our staff will share SPiN System™ software updates, tips and techniques to refine your bronchoscopic approach. Join us for a comprehensive demo of the SPiN System™ and immerse yourself in hands-on training at our state-of-the-art training facility in St. Louis, Missouri. Interested in courses or training? Let us know.